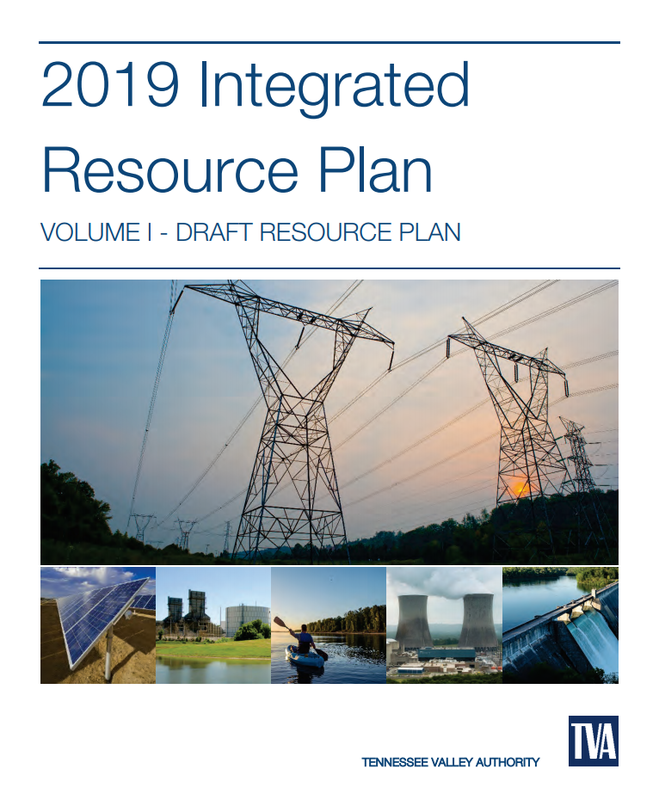 The Tennessee Valley Authority (TVA) released its draft 2019 Integrated Resource Plan (IRP) and accompanying draft Environmental Impact Statement (EIS) on February 15, 2019. The aim of the 2019 IRP is to enhance TVA’s ability to create a more flexible power-generation system that can successfully integrate increasing amounts of renewable energy sources and distributed energy resources (DER). In developing this draft IRP, TVA staff specialists – with significant input from stakeholders (including North Carolina’s appointed representative to the TVA Regional Energy Resource Council) and the public – considered a wide range of future scenarios, various business strategies, and a diverse mix of power generation resources (access the Interactive IRP tool here). In order to comply with the National Environmental Protection Act, TVA has also prepared a draft EIS to analyze the 2019 IRP’s potential impacts on the environment, economy, and population in the Tennessee Valley. TVA will accept public comments on both the draft IRP and draft EIS until April 8, 2019. Providing comments will help to inform TVA as it incorporates input into the preparation of the final IRP and EIS. The final documents will be made available to the public for review for at least 30 days before being presented to the TVA Board of Directors for approval, which is anticipated in August 2019. TVA has scheduled several meetings across the Valley on the draft IRP and draft EIS in an effort to better inform and involve the public, by inviting both participation and comment (more information about the public meetings is available here: https://www.tva.gov/Environment/Environmental-Stewardship/Integrated-Resource-Plan). Serves Avery, Burke, Cherokee, Clay, McDowell, and Watauga counties, covering a total of 5,535mi2 and representing about 6% of TVA’s territory. Sells power to the Murphy Power Board, Blue Ridge Mountain Electric Membership Corp., Tri-State Membership Corp., and Mountain Electric Cooperative, which in turn serve more than 33,600 households and 9,000 commercial and industrial customers. Owns 4 four hydroelectric dams Apalachia and Hiwassee in Cherokee County; Chatuge in Clay County; and Fontana in Swain and Graham counties. The reservoirs behind the dams provide recreational and cultural resources as well.